Gutter cleaning on your Golden Valley home might not be the first thing on your mind going into winter, but it is important to get those gutters cleaned before winter so they are ready come spring and are not clogged once the rains start. We are a gutter cleaning company servicing the Twin Cities and Golden Valley area. 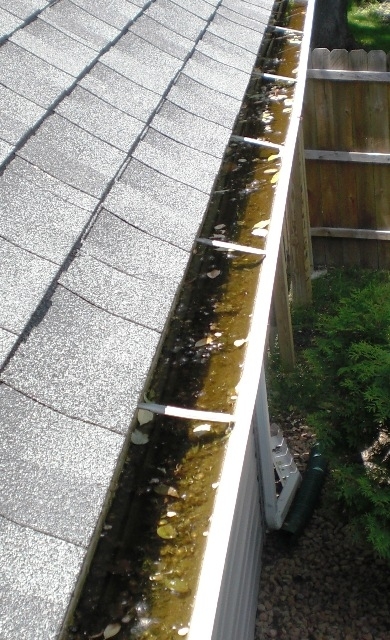 How will we clean the gutters on your Golden Valley, MN home? We clean gutters the way they are meant to be cleaned, by hand. Others will take shortcuts like blowing out gutters with leaf blowers leaving a mess behind around your home. We hand clean each section of your clogged gutters to make sure they are ready for the next rain fall. After we hand clean your dirty gutters we flush the system out to make sure everything is flowing properly and downspouts are not clogged. When we are done we take all the gutter junk with us! When is the best time to get the gutters cleaned on my Twin Cities home? For most homes the best time to clean your gutters if you only plan to do it once is in the fall after the leaves have fallen. Cleaning your gutters in the fall is best since they go into winter clean and ready for the spring rains. Spring is also an option for cleaning your gutters, the only downfall is sometimes the spring rains come before your dirty gutters get a chance to thaw out and are able to be cleaned. Otherwise many Twin Cities homeowners wait till there is a clog which is fine but time is critical once plugged since now water is pooling and spilling over dropping straight down to your landscaping and maybe finding its way into your home. Is there anything else River City Home Solutions LLC can do for me while they are out cleaning my gutters? Since we use water to flush your gutter system there is a very good chance we are going to get the outside of your windows dirty. We offer a “quick” clean to our gutter customers which is outside only window cleaning and not as detailed as our regular window cleans, but we promise you will be happy with the value as it is discounted compared to our full cleans. How do I get River City to clean the gutters on my Golden Valley home? The first step is contacting us through either our contact page(preferred) or calling. Regardless how you contact us please make sure to leave your full address so we can come out and give you a free estimate. Upon receiving the estimate it is up to you when you want us to come out and clean your gutters, we can typically get them done the same week you contact us. What do I need to do when the day comes to clean the gutters on my Minnesota home? Besides making sure the outside water is turned on for us so we can flush your gutters nothing! You don’t even need to be home when we arrive. Since we do not need to enter your home you won’t need to be home and we will simply leave the invoice in your front door once completed. Serving the following areas: 55416, 55426, 55422, 55427.